Hello, there! Let me take you on a little jog down memory lane; don’t worry, it’s not a real jog and the memory isn’t from that long ago. Only four weeks! But a lot has changed since then, namely a new job, which had put this dessert discussion on the back burner, figuratively, while I got settled and then realized... wait! I forgot to tell everyone about the most delicious treat I ate this summer! 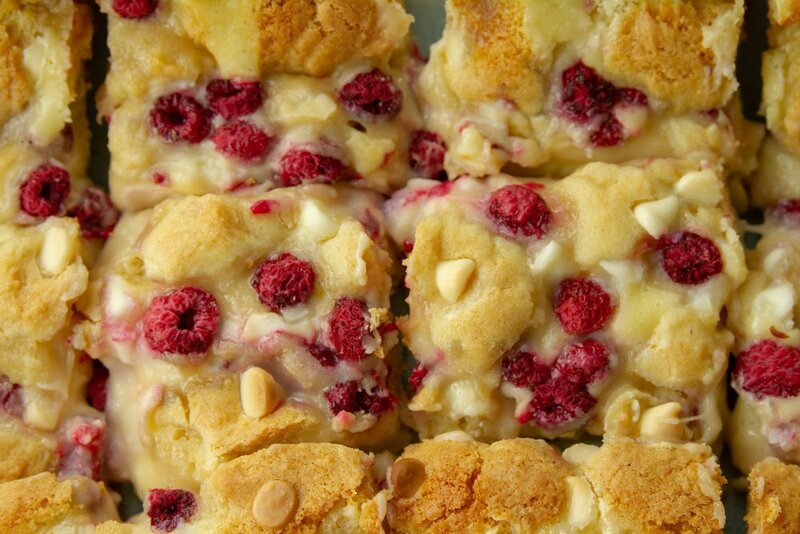 Raspberry-White Chocolate Cheesecake Cookie Bars were one of the most decadent, scrumptious, and sweet treats I had ever baked, and I must tell you about them. GFMD: Use gluten free flour (I use Cup4Cup) instead of regular. No other changes necessary! Make sure your white chocolate chips are labeled properly, too. Essentially, this multi-layer dessert (mid-morning snack?) 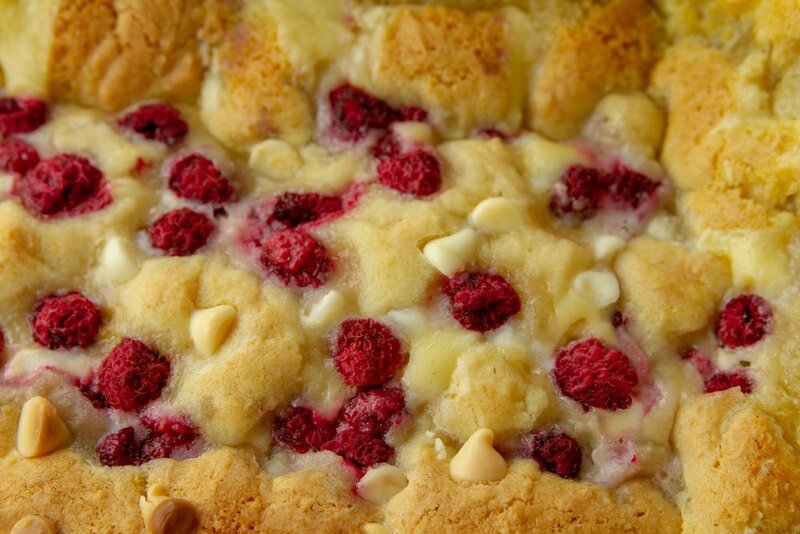 is a layer of plain cookie dough topped with white chocolate chips, raspberries, and a cheesecake-y liquid, then topped with more cookie dough, white chocolate chips, and raspberries, and finally baked until every single sweet ounce has baked together forming a giant pan of cookie bar heaven. Sure, there’s no dark or milk chocolate involved, but I assure you it’s the most delicious thing since a classic chocolate chip cookie. And the layer of cheesecake (creating a gooey center in every bar) adds a perfect element of salty amidst all of the joyous sweetness. I wish I had one right now! My sweet tooth has emerged in the last few years and it was on fire when eating one of these indulgent treats. Don’t worry, my baking friends, simply swap out the regular flour in the recipe and use Cup4Cup for divine results. The recipe is pretty self explanatory and is written well. Follow instructions for lining the baking dish with parchment which makes removing the bars from the pan much, much easier. Taste test as you go along - oh wait- I just do that because I have no control over dough and cannot resist it. I would recommend making the bottom cookie layer slightly thinner (I think I didn’t split it up evenly enough) so that you have plenty of dough to go on top. Fun fact: while baking, the bottom cookie dough layer will “rise” and bake up the sides of the baking dish creating a “wall” of cookie all around the edges. YUM. While not the most beautiful aspect of the final product, this cookie wall is definitely a good result: that wall/edge serves as a barrier for the cheesecake from spilling out and is a handy part to hold while eating! 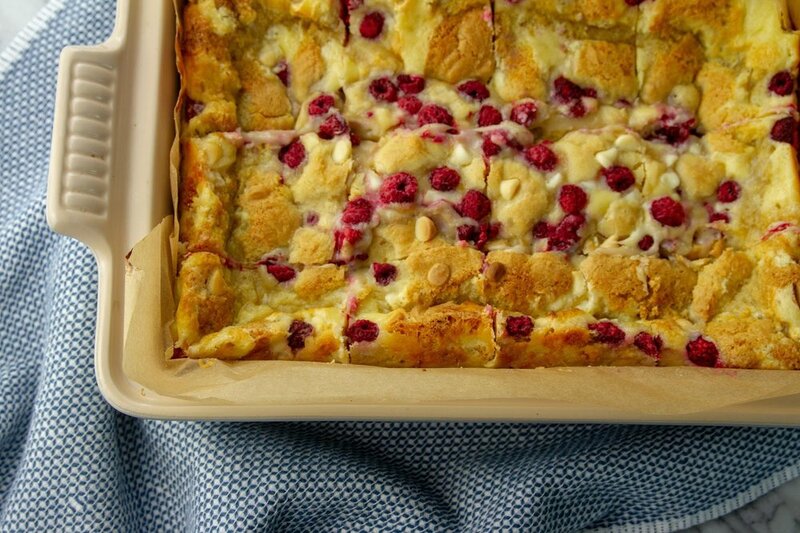 The center bars were packed with cheesecake, raspberry, and white chocolate, but due to their lack of formal edges, they were much messier to eat even when served cold right out of the fridge (the recommended way). While the most-middle piece may not look fully baked, trust me, it is definitely done. And it’s awesome. So, now that I’ve gone on and on about how delicious these bars were, and how easy they come together, let me leave you with this: they are Rich. Not expensive to make, but hearty-like-whoah to eat. I cut up the finished pan into twelve, large bars. I barely ate half of one before I was in a sugar coma and was so full I (almost) skipped lunch. Fine, I did try them right after breakfast because I was on vacation and couldn’t be patient any longer (they chill in the fridge overnight after baking), but oh. wow. As delicious as they are and as much as I loved every bite, I would recommend cutting up each of those twelve bars into two triangle-shape pieces which I think would be a perfect dessert size portion. Storage note: keep the finished bars in the fridge for the best shelf life. I transferred them to a serving platter once chilled overnight and stored in the fridge all week.